Fitness For The Rest of Us: MealEnders: Clear Cravings From the Body & Mind! MealEnders: Clear Cravings From the Body & Mind! 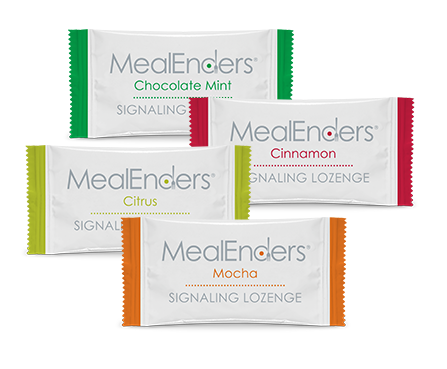 MealEnders Signaling Lozenges are a super cool & revolutionary way to help beat overeating and master portion control by clearing cravings from the mouth and mind. MealEnders’ Duo-Sensory Active-Taste System combines the best of food science and behavioral psychology to offer a low-calorie and stimulant-free way to fight the urge to overindulge. And they taste great- I am enjoying a Mocha MealEnder right now, as I type and the outer layer is like a mocha flavored truffle- for real SO GOOD! The outside is rich & creamy and the center is like a cooling hard candy. The center really does provide a cooling/ tingling and palette cleansing sensation! I cant wait to try the other varieties. Keep reading to learn all about MealEnders. 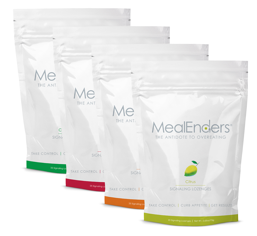 MealEnders are a first-of-its-kind food-based weight management tool, MealEnders work on a behavioral, sensory and psychological level to curb overeating and teach portion control. Food-based and free of harmful "diet" ingredients, they present the first solid strategy I've heard of to help people safely learn to eat less. 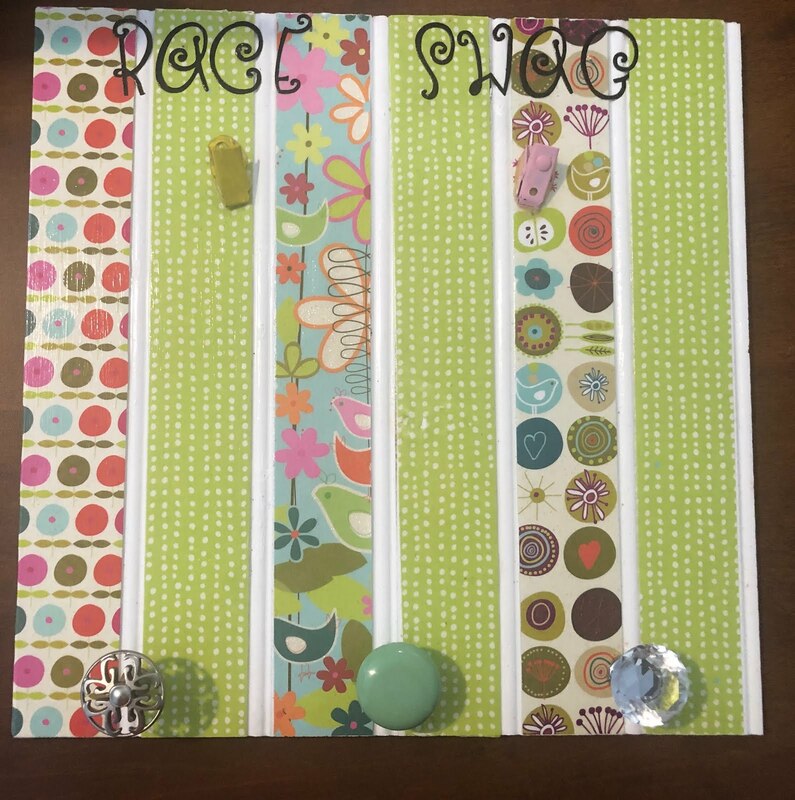 By engaging us both mentally and physically, the signaling lozenges heighten awareness of natural satiety signals, helping us regulate portion size and master the healthy habit of mindful eating. MealEnders work on a behavioral, sensory and psychological level to empower smarter eating. And again- they taste great. The flavor is so satisfying that I feel like I am enjoying a decadent dessert -but MealEnders contain only 15 calories each! MealEnders consist of two components: a sweet, outer reward layer and a cooling/tingling inner core. The outer layer provides a measured dose of ³dessert" associated with the end of a meal, while the inner core engages the trigeminal nerve with long-lasting cooling/tingling sensations to clear the palate. Sucking on a Signaling Lozenge" when you know you've consumed enough -- but can't stop -- keeps your mouth and mind occupied during the 20-minute Overeating Zone, giving your body's natural satiety process time to catch up. Unlike extreme diets, meal replacements, appetite suppressants or supplements that focus solely on your stomach (and many contain harmful ingredients), MealEnders work with your body¹s natural hunger rhythms. Regulated by the FDA as a food product, each MealEnder has only 15 cal, 2g sugar and are low in low-fat, gluten-free, kosher, and contains no high fructose corn syrup or MSG. Love that they contain real ingredients not chemicals like many other diet foods out there. MealEnders are a safe and sustainable way to curb your appetite. They contain no drugs, added stimulants, herbs, or other toxic ingredients. MealEnders consist of two parts: a sweet, outer reward layer and a cooling/tingling inner core. The outer layer provides a measured dose of ³dessert," usually associated with the end of a meal. The inner core engages the trigeminal nerve (the nerve that senses ³taste² sensations in the mouth) with long-lasting cooling/tingling sensations to cue the end of eating and clear the palate. By keeping your mouth and mind occupied for up to 20 minutes (the Overeating Zone‹the period when people are full, but continue to eat), MealEnders naturally transition you away from the desire to overindulge, giving your body's natural satiety process time to catch up.MealEnders come in 25-piece pouches in four flavors: Chocolate Mint, Cinnamon, Mocha and Citrus.